Need instructions for a Drive game? Let managers know how their players are doing by scheduling automatic reports that can be sent directly to their inbox. You choose which reports you want to send and how often you want to send them. 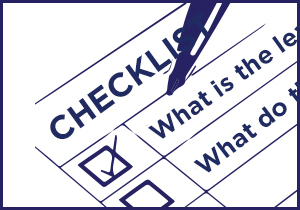 You also decide what information is included in the reports each recipient receives. 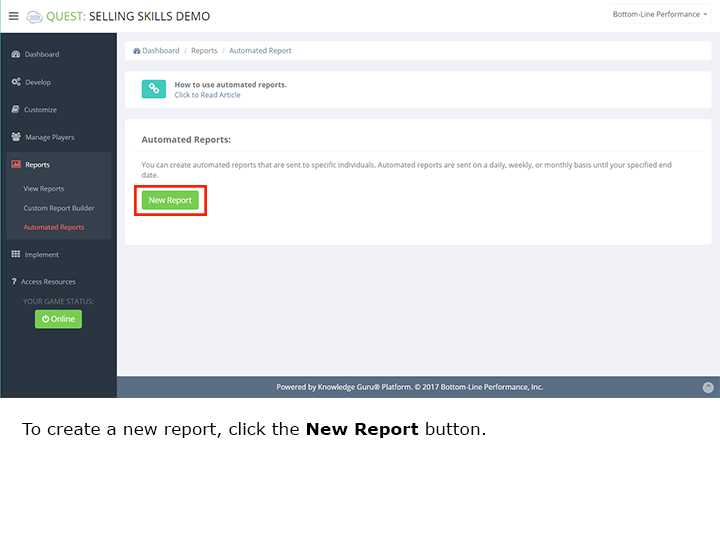 Under the REPORTS option in the left-hand menu, select AUTOMATED REPORTS. Type a report name in the NAME OF REPORT box. 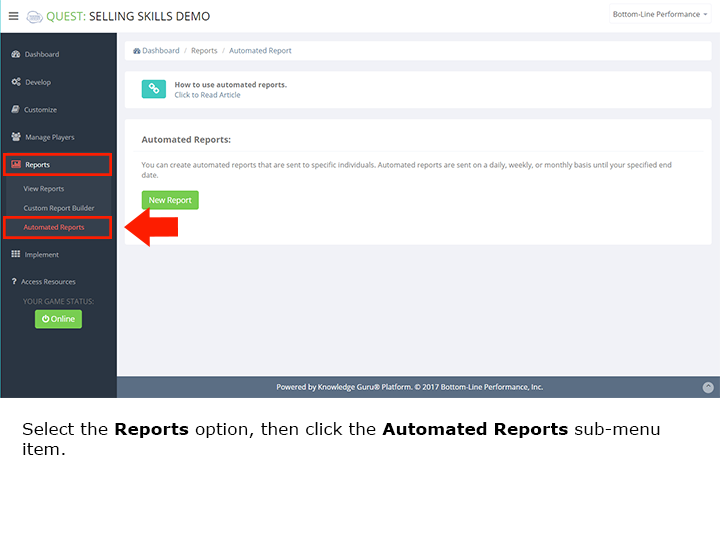 Check the box next to each report you would like to automatically send. 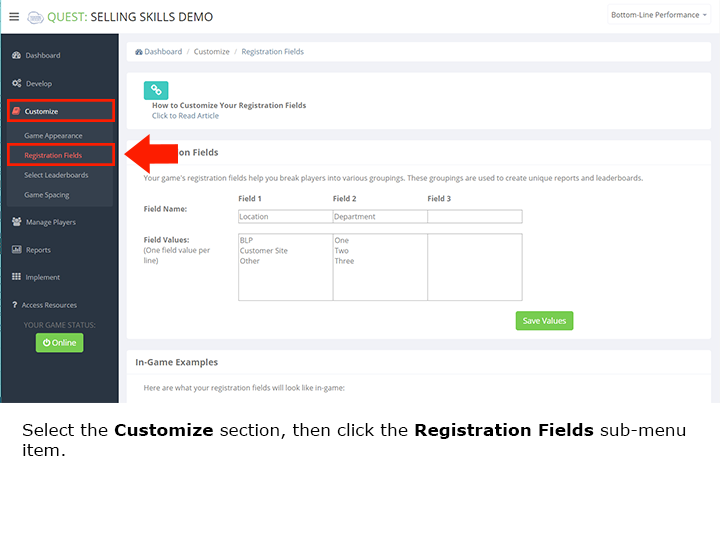 Use the FILTER dropdown(s) next to each registration field you created to only send reports for a specific group of players. Use the FREQUENCY dropdown to decide how often reports will be automatically sent. (Optional) select an expiration date for your automatic report. Format: mm/dd/yyyy. 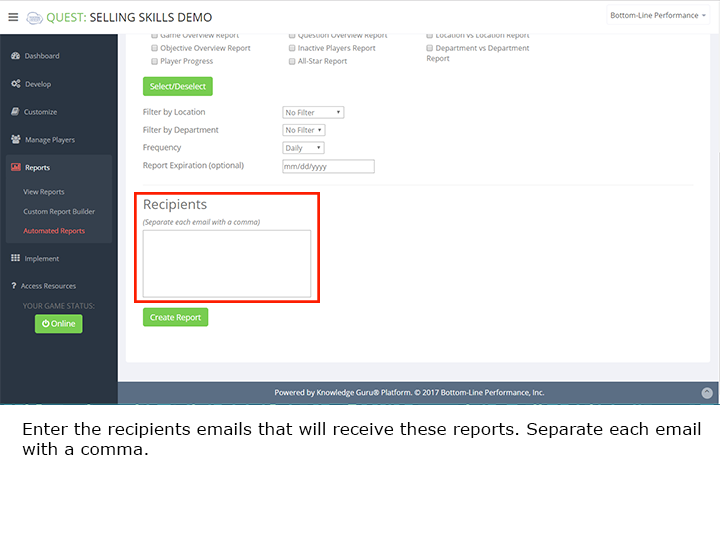 Type the email addresses of the report recipient(s) into the RECIPIENTS box. Separate each email with a comma. If you no longer want to send your automatic report, click the red REMOVE button next to the report you wish to cancel. 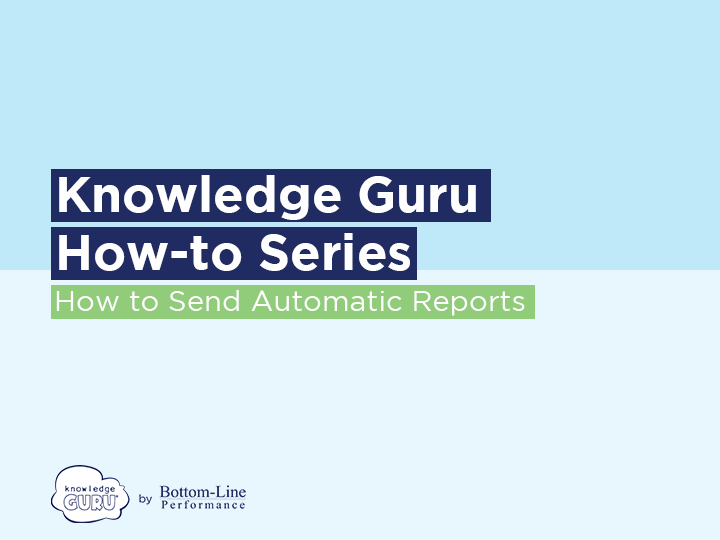 Knowledge Guru allows you to customize your reports to include the information you want and filter out what you don’t. 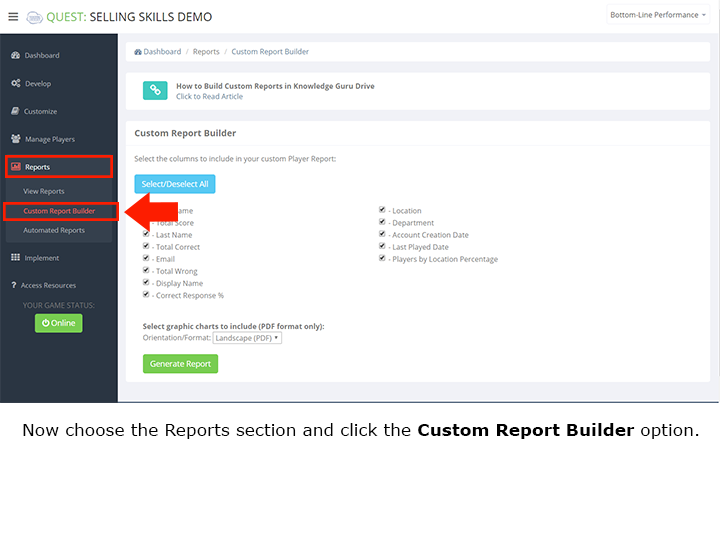 Under the REPORTS option in the left-hand menu, select Custom Report Builder. Select all of the items you would like to include in your custom player report. Choose the orientation/format for your report from the drop down menu. If you want to track something specific besides the default fields already in the custom report builder, you can customize unique fields. For example, maybe you want to track high scores by job title or compare performance across different departments. To do this, you can change the field that you run reports on by creating custom fields. 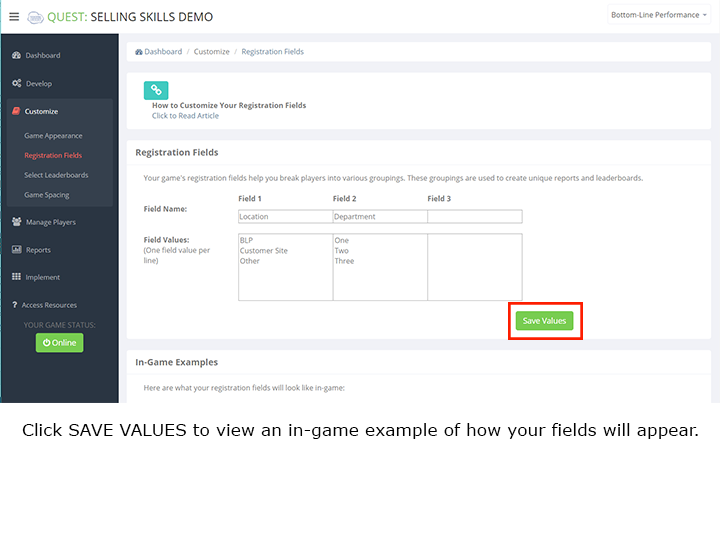 You can create up to three different custom fields. 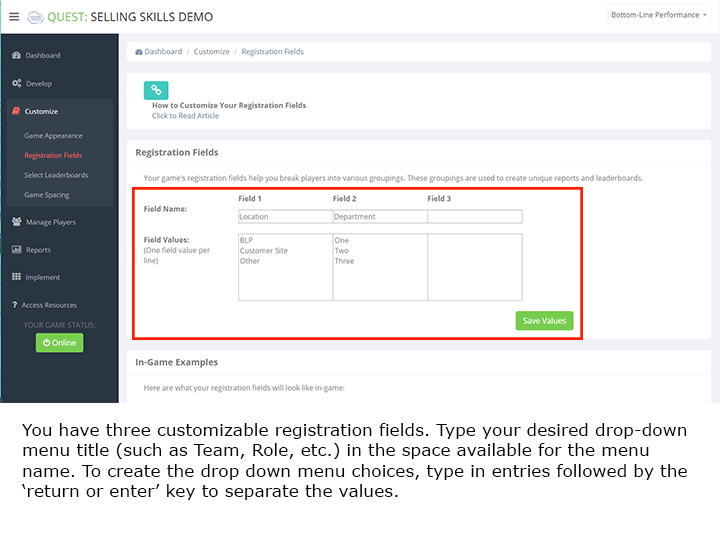 Under the CUSTOMIZE option in the left-hand menu, select Registration Fields. Insert the appropriate Field Values below each Field Name. 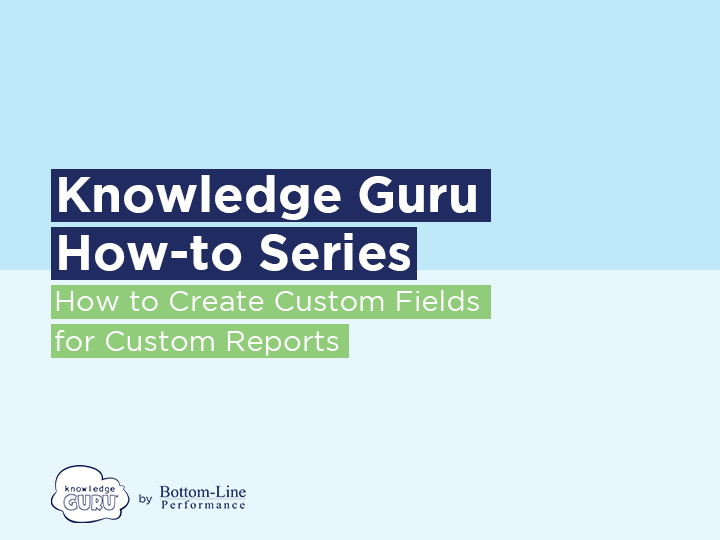 You will now see your new Custom Field Names you can use to run customized reports. Once you’ve finalized the items you want to include in your custom report, you can download your report as either a .pdf or .csv file. 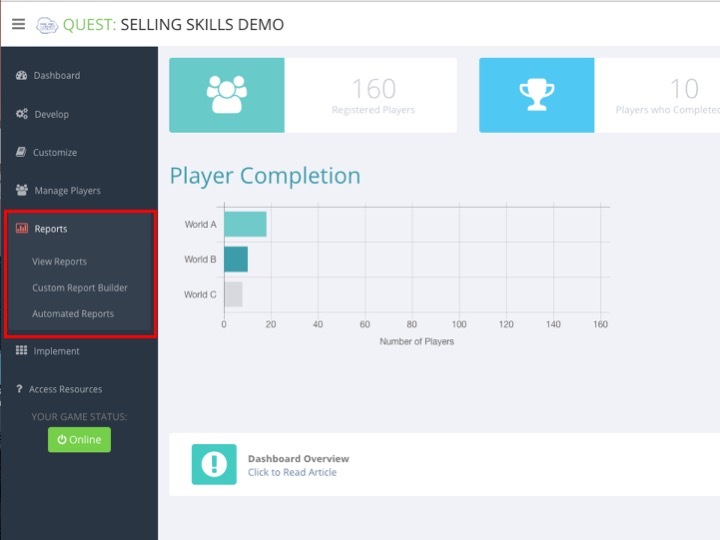 Both Quest and Legend game types include a variety of reports you can use to track player progress. 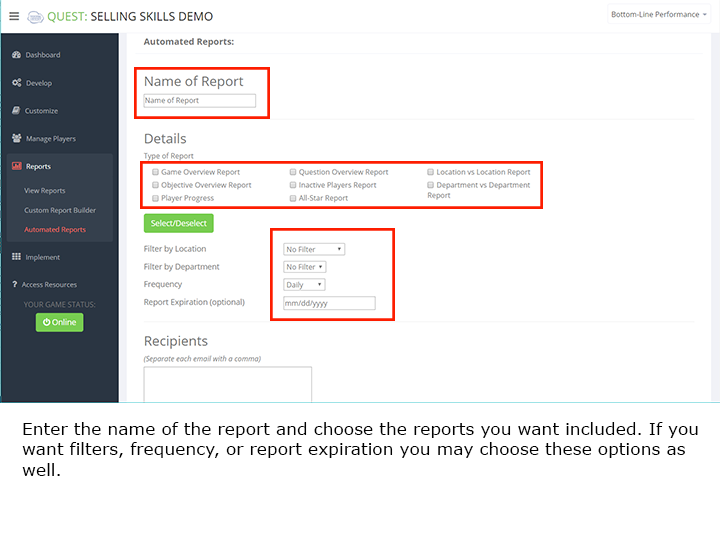 The authoring tool does a nice job of describing your report options so this article will not detail all options. Instead, we will focus on the types of information you might want to gather – and which report is the right one to use. 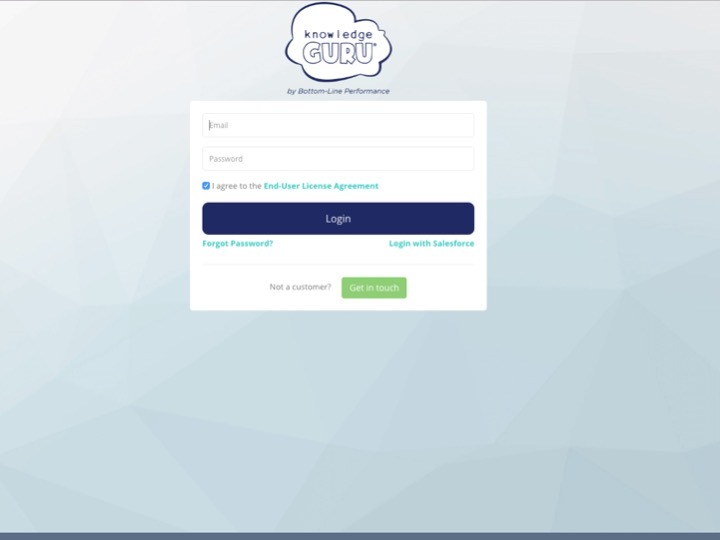 Log into your game's admin tool at kguru.co/login. Use your email address and password. Click "Reports" in the left-hand menu, and then click "View Reports"
You will see a list of reports. Click "View" to view in your browser or "Export" to create a PDF or .CSV. The game overview report shows overall game statistics. 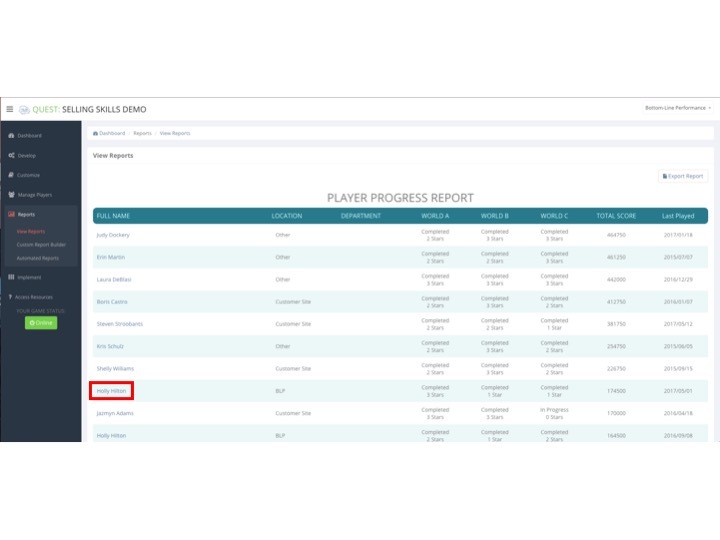 Click the name of an individual player on the Player Progress Report to see their individual results. 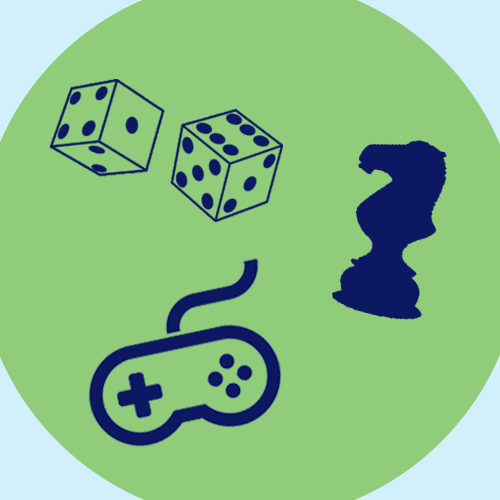 The objective overview report shows how your learners performed at each learning objective in your game. 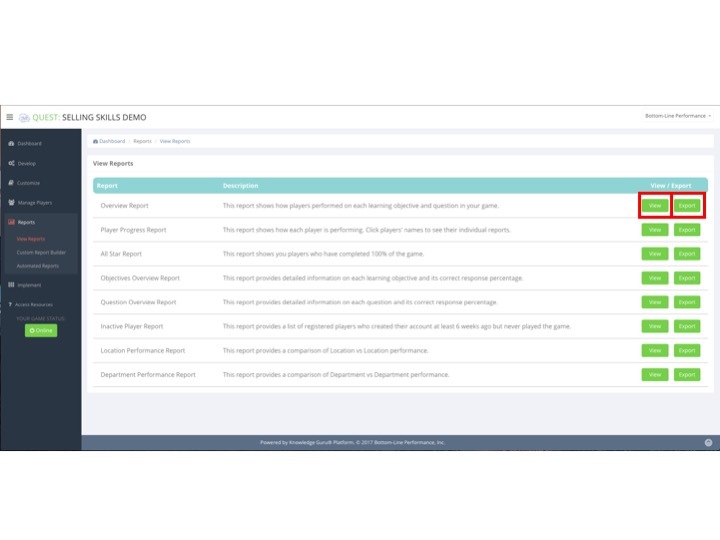 If you want to know how a specific player is performing in the game, access the Player Progress Report. 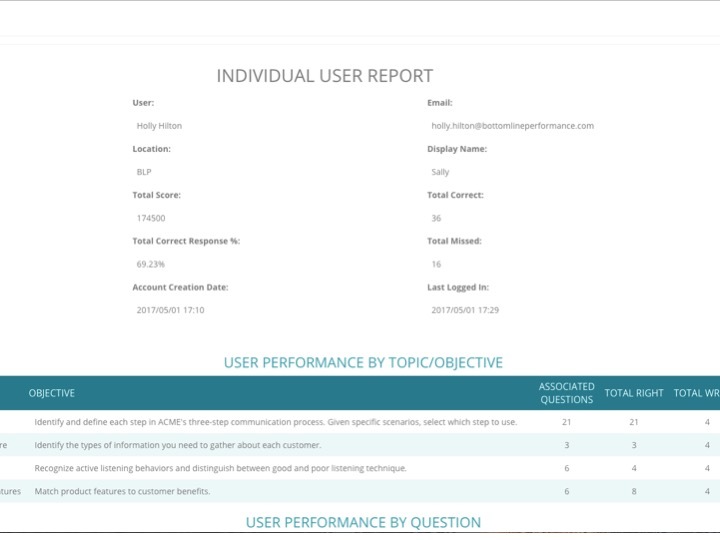 If you want to see overall player performance across topics (how well are people doing as a big group), access the Objective Overview Report (macro view) or the Question Overview Report (micro view). If you want to compare performance across groups, you can access a report whose name will mirror whatever name you created for your first custom user registration field. Example: The default name for this field is Location so if you did not change this field name and you set up multiple location options, then you can pull a report that lets you see how people performed in specific locations. The default report name is Location Performance Report. If you changed the field name of Location to something else, the report name will reflect this change. 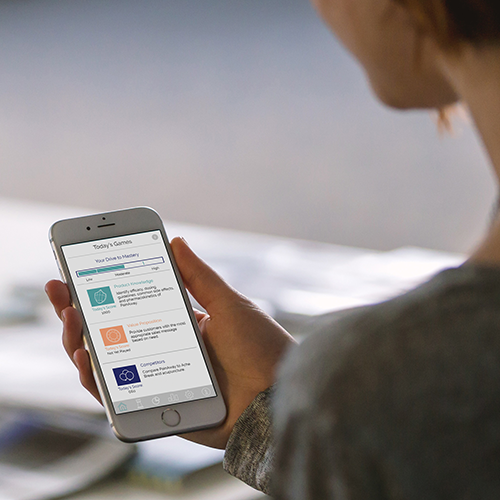 If you want to verify that people’s performance is improving across the three iterations of a question, access the Question Overview report. The “A,” “B,” and “C” iterations of each question appear in this report. Ideally, people’s performance will improve from the “A” version to the “C” version. If you are not seeing this, consider whether your question is worded poorly. This report can be very useful in identifying questions that may be confusing to players. If you want to verify the number of players you have in the game and what their progress is within the game, access the Game Overview Report. This report tells you how many players you have, and what percentage have completed each World in the game so you can see how far most players have progressed. It also includes a detailed summary of your game’s topics, objectives, and questions and shows you the correct response % for those items. Finally, it lists the performance challenges that are part of your game. 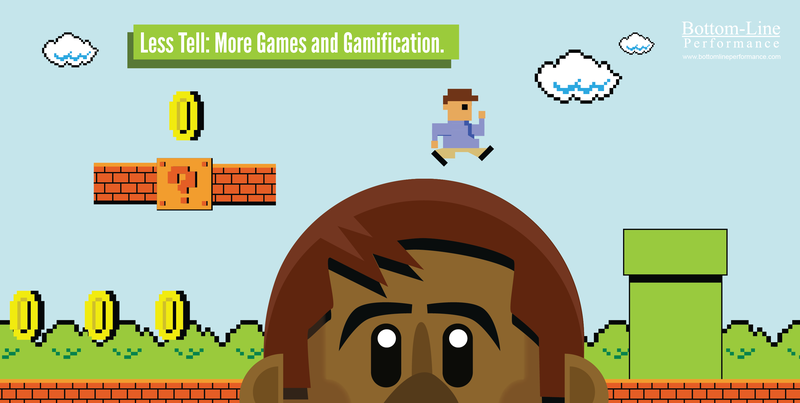 This is a useful report to showcase to managers and stakeholders who want to see what a game is about and what content it includes. Many of the reports can be downloaded as a PDF or as a CSV file. Choose the CSV option if you think you might want to do further manipulation of the data. 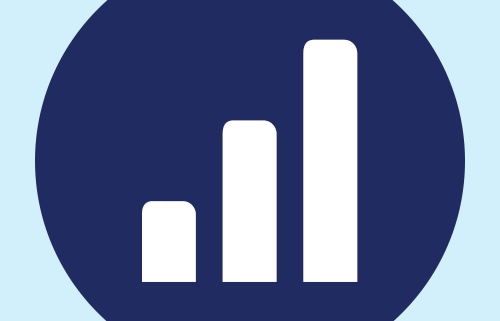 By downloading as a CSV, you can then re-save the report as an Excel spreadsheet, reformat it to your taste, and then sort the data to suit your needs. You may have a need for some very specific data – and not care about other data. You can use the Custom Report Builder to choose what information you include/exclude from a report. 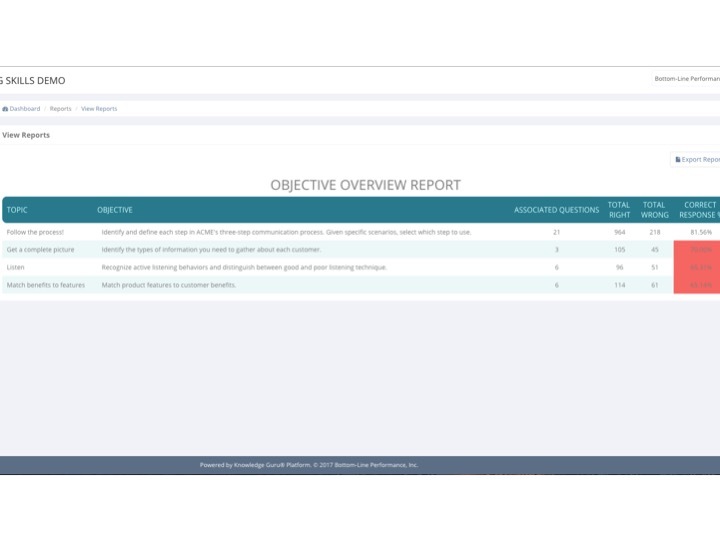 You can create reports that are automatically sent to your stakeholders. Learn how here.